Geodesic fruit tree hoop house? 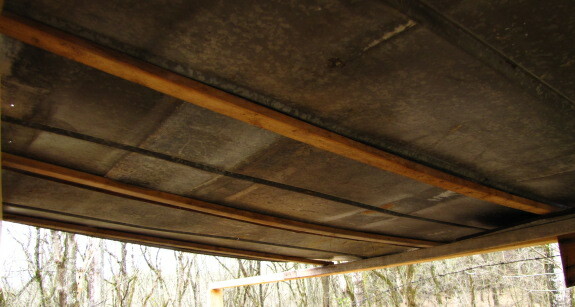 I used several furring strips as a roof supporting material on the used pallet chicken coop because it's all we had on hand at the time and I like experimenting with cheap options. The goal is to eventually arrive at a design that is easy and cheap to replicate while lasting a decent amount of time. Lately I'm liking this geodesic frame structure which I think is using 1x1's or 2x4's and might even be able to be done with furring strips. Maybe as a future mushroom lab or some sort of fruit tree hoop house or some other yet unknown function. The bending stiffness (EI) of a beam is determined by the Young's modulus of the wood (E) and the dimensions of the cross section (w)idth and (h)eight; EI=E·b·h³/12. So for optimal stiffness of the roof support you should rotate the strips by 90 degrees along the length axis, so that the height is larger than the width. 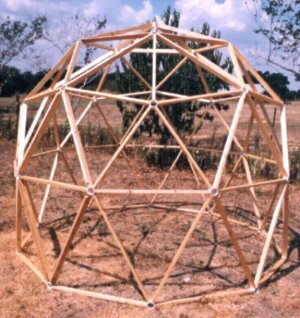 As you can see, the difficulty in building a geodesic dome lies in the connection between the long pieces of wood. This type of construction made out of triangles can be very rigid and strong. The solution of using rings as the connectors is quite elegant. You might get away with cutting the ends of the strips at the appropriate angle, drill holes near the end and tie the strips around a piece of pipe with a big zip-tie. But that is not a very solid construction, I think. It would be better to make cirles of thick plywood and cut five or six slots in them using a router and templates. Then you can bond the strips into the slots in the plates using some simple jigs for the correct angle, and your dome is done. That would be a much stronger construction. Satellite dishes make a good roof structure and you can get them free for the taking, all you need to add is vertical post and siding. I have built a couple of the these structures with good results. On edge strength and satellite dish roofs. Roland --- excellent points, as always! I think that if I hadn't been cracking the whip so much, Mark would have remembered to lay the furring strips on edge the way we do when laying down floor joists. Zimmy --- Good reminder! I really loved the photos you sent us of your satellite-dish-roofed structures. We'll have to keep our eyes open for some --- there's always something else to be built!